1 small handful Dried Scallop (optional). The first step is to blanch the fresh meats in salted water. This removes any bloody or raw-meat tastes (which is disliked by most Chinese0, and, more importantly, it assists in keeping the stock clear later. This is a good practice for most stocks but it is particularly recommended here. 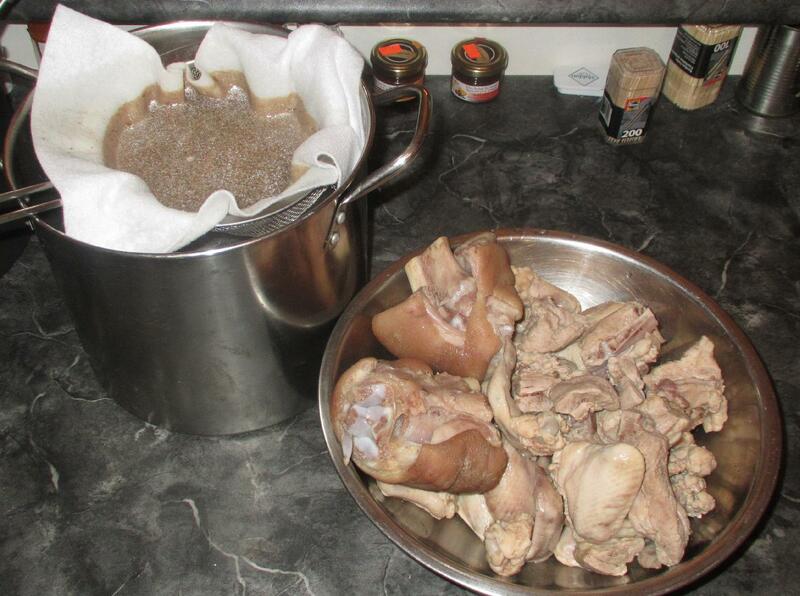 About 1 – 2 minutes is needed for smaller pieces (chicken wings, for example), but 3 minutes or so will be necessary for larger pieces like pork hocks. After blanching, rinse the individual pieces very thoroughly, making sure to remove all scum, or ‘bits’ from the surfaces. The ham, by the way does not need to be blanched, although you may wish to rinse it briefly. Now add the meats and all the solid ingredients except the salt and cover with the water (make sure it is cold, not hot). The exact amount of water is not critical but we are aiming for about 4 quarts of finished stock and the important thing is to make sure all the solids are covered during cooking. If the level should fall below this amount you can replenish it as you go. Put the pot on a low heat and slowly warm the water, increasing the temperature bit by bit until the surface barely begins to ripple. 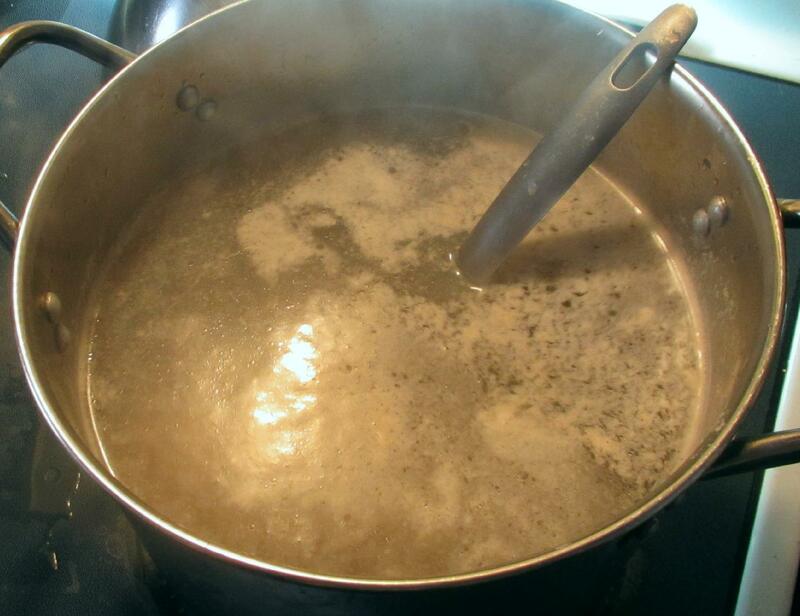 It is important that you do not boil the stock at any point so keep a weather eye on it and keep it at a gentle simmer. During the process, and especially in the early stages, you will see a little foam, and maybe some small fragments, appear on the surface. This will be minimal if you have properly blanched and rinsed the meats and you can skim what does arise away with a ladle or other suitable implement. The ‘brewing’ time will be somewhere in the neighborhood of 4 – 5 hours but start tasting after 3 hours or so to see how things are going. Once the flavor is to your liking, add salt to taste. Once finished, remove the solids from the liquid. Discard the ginger and vegetable pieces but keep the meat for now as it still has residual goodness in it. If desired (and I recommend this step) strain the broth through a cloth and then pour it into storage containers. It will keep in the fridge for a few days or in the freezer for a couple of months. I mentioned that this particular sort of stock is usually prepared for special soups and dishes, usually involving expensive ingredients like Shark’s-fin or Abalone, etc., but you can, of course, use it in any non-vegetarian dish where a good stock is called for. 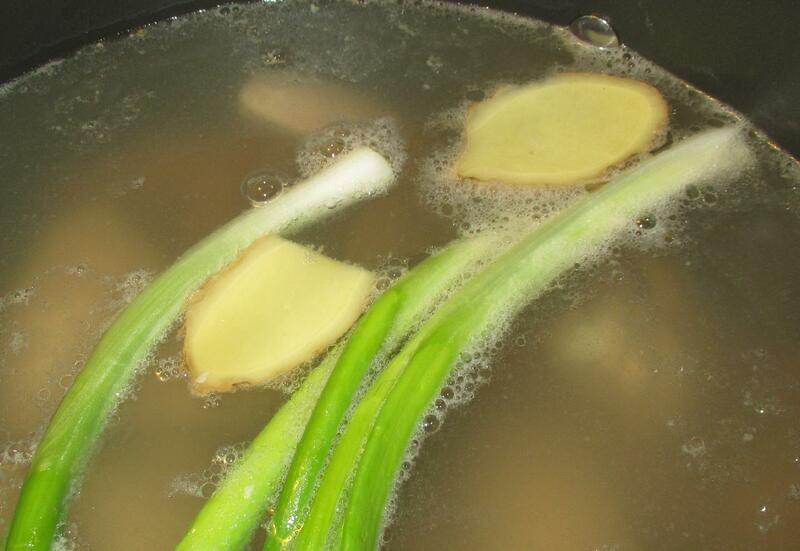 This may be a soup, but the broth can also be used for braising, or forming the base for sauces and the like. 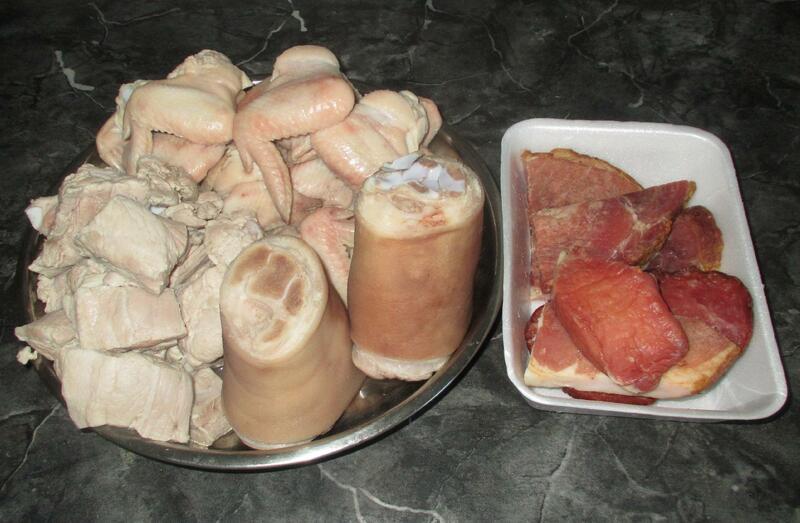 Here you can see a little of the finished stock after it has been chilled. 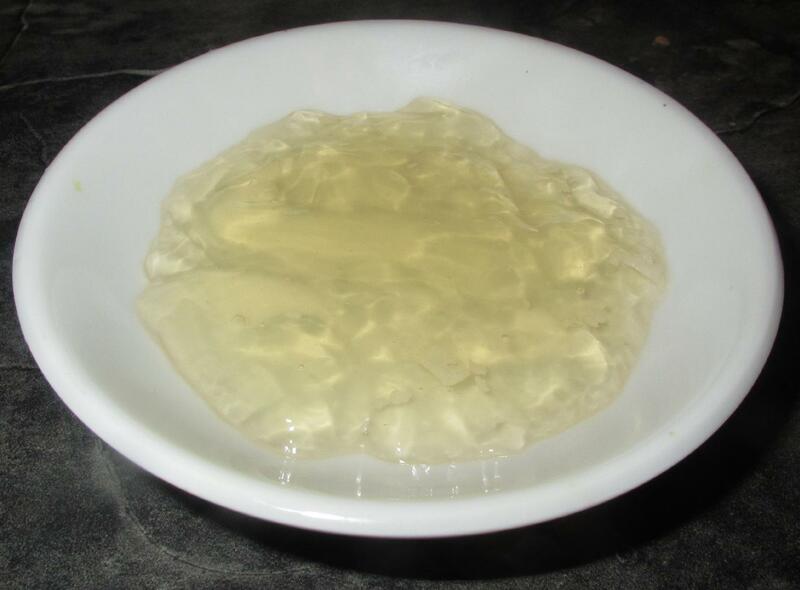 As you can see, it is beautifully clear and has a jelly-like consistency that will translate to a lovely silky mouth-feel when heated and eaten as soup. You can, if you want, increase this by adding the skin and cartilage from the pork hocks back in to the pot and letting it simmer for a bit longer. As for the meats recovered from the pot initially, I suggested you not throw those away as it is still possible to derive further goodness from them in a ‘second-run’. Simply put them bits back in a clean pot and cover with water (about 4 quarts, or so), and then re-simmer as before. The result will not be quite as rich as the first run but you can add a few more other flavoring ingredients, such as more mushrooms, or even a bit of celery, onion, or a carrot or two. If you reduce it sufficiently (and the amount will depend on the ‘goodness’ left in your meat), the result can be used as a regular, everyday sort of stock, or the basis for a much richer one using fresh meat. 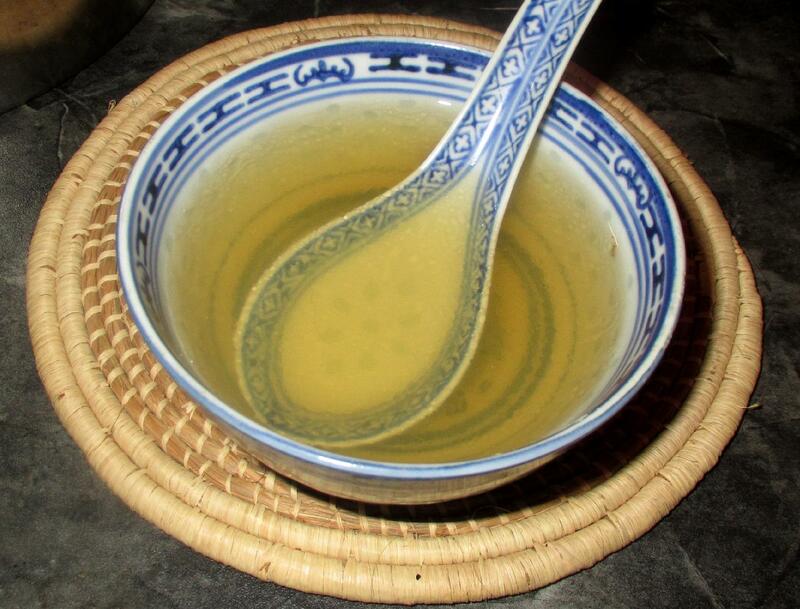 You can tell by how clear and thick the chilled broth is that it is indeed a rich stock. Something I learned from my Mexican friend is to add a couple of chicken feet for great flavor and richness. Funny little perfectly boney piece of the bird that really does the trick. And it’s cheap. Plus, I like to gross friends out by telling them I cook with chicken feet. Gets a horrified look every time, especially the part about being great dim sum when braised. Lol. I did not know to blanch meat. In a pinch, can you use egg white and shell? I suppose you could, but that’s quite a bit of work and not really necessary if you blanch and skim (which is *much* easier). 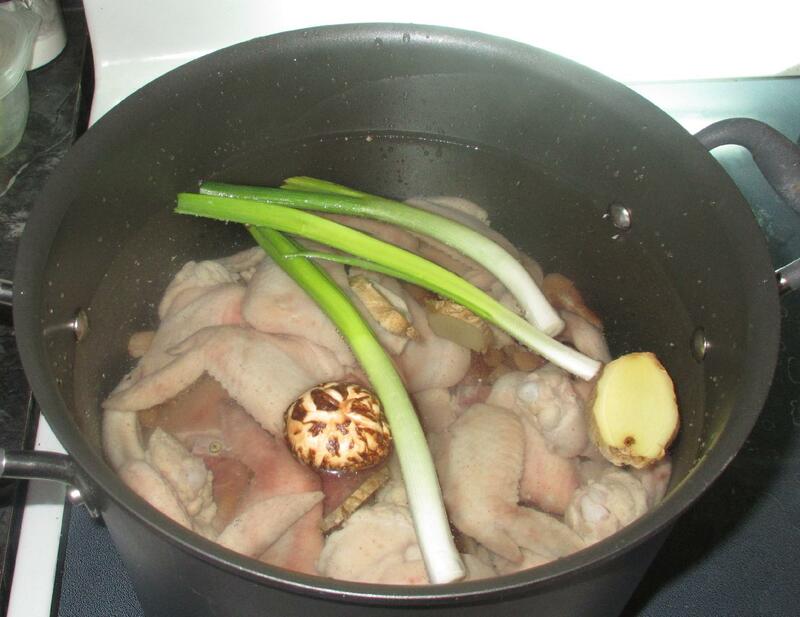 I do this for all stocks with meat… It is widely done in Japanese as well as Chinese cookery. Great post. I usually use my secondary stock for cooking instead of water, like when I am making a stew. Same here … or I’ll freeze it in 1/4 cup sized portions for making stir-fry sauces etc. Great idea about freezing, thanks. Thank you! I do not think I have ever made as rich [or expensive] stock or as simple 🙂 ! I can sense the taste, and after Easter, this is one of the first tasks on the menu!!!! Thank for the recipe. I’ll pair it with abalone instead of shark fin which is an inhumane ingredient.